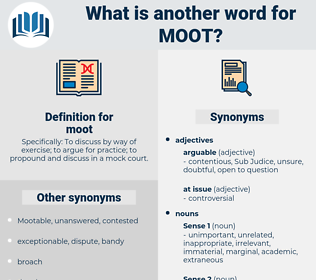 What is another word for moot? Specifically: To discuss by way of exercise; to argue for practice; to propound and discuss in a mock court. questionable, irrelevant, debatable, disputable, controversial, contentious, arguable, non-applicable, pointless, dubious, notional, superfluous, unnecessary, futile, meaningless, conceptual, applicable. Discriminated, Questioned, Debated, contained, Subjected, featured, addressed, predicted, Undergone, Singled, Dealt. incontrovertible, uncontroversial, agreeable, unquestionable, peaceful, undoubted, undisputed. inarguable, sure, Indubious, questionable, Uncontestable. unarguable, conclusive, unchallengeable, Questionless, unanswerable, absolute, relevant, positive, decisive, undebatable, settled, unambiguous, undeniable, accomplished, uncontested, hands down, indubitable, noncontroversial, unequivocal, incontestable, clear, irrefutable. The modern visitor to the old town walks beneath the gloomy archway, with its time - worn stones, which forms the basement over which the Moot Hall stands. manatee, man-made, mahomet, myth, muted, maidu, menotti, manidae, metadata, meat, mitt, mediate, matted, mate, memento, mode, mad, meth, moiety, manteodea, mut, mantidae, mud, maenad, mounted, meade, matte, mayweed, mind, monod, motet, manteidae, manat, mined, motto, mat, manhood, manta, minuit, mohammed, Mothy, maimed, minded, mentha, minute, minuet, montia, moth, meadow, mound, mote, meed, medea, manhunt, mott, mayday, moment, mood, mantua, MDI, mamet, mammutidae, mutate, manned, mimidae, mit, mouth, matthew, meaty, month, moody, mutt, mahout, mete out, mute, mt, mediety, maundy, mated, made, myoid, mot, munda, mammut, monument, mande, monte, matey, moated, minutia, moneyed, md, mod, mennonite, manumit, monet, muddied, mount, momot, mediated, meted out, med, mountie, midi, mahound, minuend, monody, moat, mammoth, momotidae, matt, manet, Mohammad, mandate, meditate, mint, manda, mead, mantid, method, midday, monnet, monad, matai, muddy, mid, minnewit, manihot, madia, Mutawa, middy, midway, muhammad, maund, math, mite, monied, Mete, miniate, mend, Mahdi, maid, monday, may day, maidhood, meet. case, cause, lawsuit, causa, suit.